Car Navi systems seem not to work about 1/2 the time coming here. Please print & bring these. This is simplest, fastest way. A. 車で、東京か千葉市から。By car from Tokyo or Chiba City area. B. JR誉田駅から. From JR Sotobo Line Honda station, walking or driving. 1. Take Higashi Kanto Expressway toward Chiba City and Narita Airport. Center), take next exit for Keiyo Doro Expressway toward Chiba and Togane. Matsugaoka. Do not take Matsugaoka exit even if navi says to, and even though the sign says “Oyumino”). point straight ahead, but do not go straight ahead. Turn left towards Honda). way to the “T” where the road ends, you went 100 meters and one traffic light too far. Mart” マミマートsupermarket will be on your left at the top of the hill. and a large white cross. Turn right into the access road. Sotobo line from Soga station, 10 minutes. After giving your ticket, go to the left and go out the south exit. 1. Go out of the station parking lot. Turn right on the road (Oami Kaido) in front of the station. 2. Go about 300 meters to the traffic light just past the Post Office. Turn left at traffic light. 3. Go about 200 meters to the end of that road and turn right. 4. Immediately turn left again at the first left, after having only gone about 5 meters. on the left. 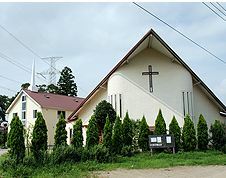 There will be a sign saying Honda Chapel 誉田チャペルand a big white cross. Turn left onto the access road. building on the left, and the parking area on the right.